SOUNDBOARD THICKNESSING AND DEFLECTION TEST - PART 2. After careful planing, I ended up with a final thickness in the bridge area of 2.2mm and 1.8mm around the periphery. 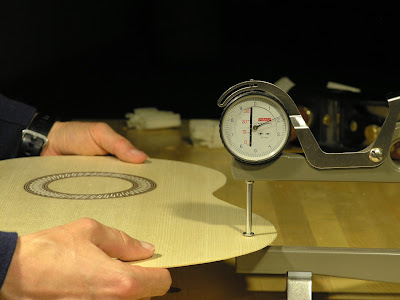 The 2.2mm thickness extends all the way from the bridge, up past the rosette, to the top of the soundboard, slowly graduating out towards the sided in a pattern parallel to the center seam. Below the bridge area the thinning follows the contour of the lower bout. 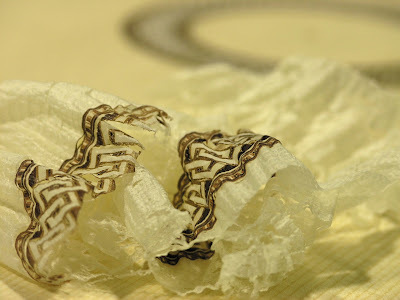 In other words the thinning forms a kind of a U-shape, rather than the shape of the guitar itself. I also repeated the deflection test and it came out showing 7.5mm of deflection; Significantly more than before but still a little stiffer than the 8-9mm target. However, at this point the soundboard felt very flexible indeed and flexing it cross grain with my hands, I was afraid of snapping it in two. It was also hard for me to detect any change in pitch, or rather character of the sound, when I tapped it. Over the weekend some further development came about on the soundboard front. 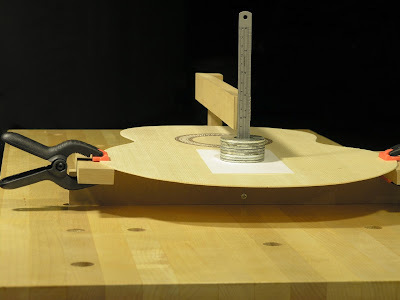 Suspecting that I might have left my soundboard to thick/stiff, a luthier friend of mine suggested trying out measuring the soundboard deflection as a more scientific approach to thinning it to it's optimum stiffness. 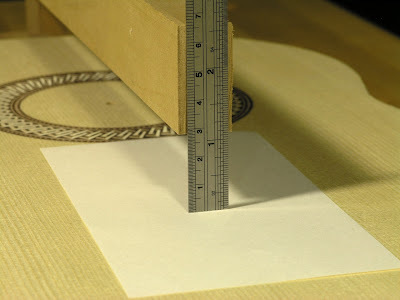 He advised that on a classical guitar, a weight of 380 grams should be able to deflect a suspended soundboard 9-10mm, measured cross grain at the bridge location. Doing the math, I should have aimed for a thickness of 2.2mm around the bridge area and about 1.8mm around the periphery of the lower bout with this smaller instrument. But, though these dimensions are thinner than what I ended up with, I feared it was just too thin, mainly because the top started to appear a little floppy, but also because I started to have difficulties hearing the pitch dropping any further at this point - It was as if the pitch had become a low rumbling indistinct sound. Mind you, I made these assumption with no practical experience to base my judgments on. Loosely following his instructions, I quickly devised this crude and simple jig for this purposed. 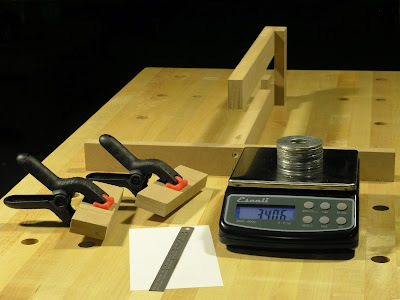 To each of the sides of the lower bout I secured a 5/8" think block of MDF with 1" plastic spring clamps, each block protruding 1/4" into the plantilla or outline. I centered the MDF blocks at the widest point at the lower bout, a little more than 1" below the bridge. I propped up the soundboard on the jig, resting the MDF blocks in line with the bridge. A small MDF block supporting the top of the soundboard was also added to the upper part of the jig to keep things stable and level. 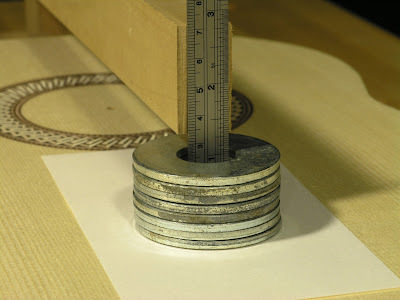 I used big washers for weights and they proved to have the added benefit of allowing a ruler for measuring to rest inside them. As this guitar is about 11% smaller than the standard, I scaled down the weight and deflection targets accordingly to 340 grams and 8-9mm. 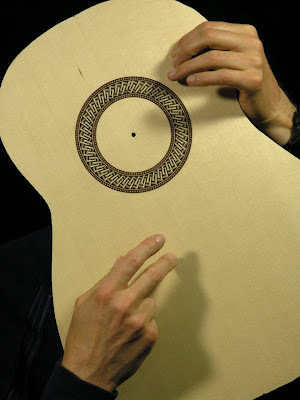 The deflection test came out showing 6mm difference between the weighted and unweighted soundboard, indicating that it indeed is too stiff. 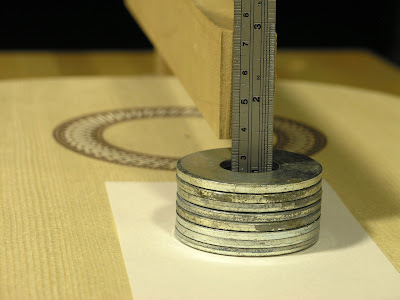 However, I'm still not sure how accurate my measuring was. 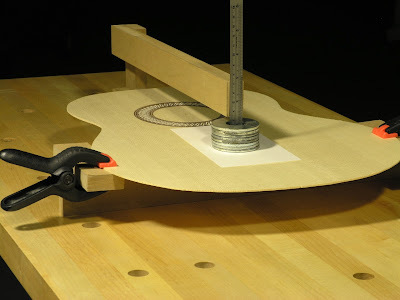 I don't know how much factors like friction between the MDF blocks and the jig played, how much the placement and size of these have entered the equation, measuring with the soundhole uncut versus being cut, etc. etc. Nevertheless, I might have to revisit the thicknessing procedure again. After some serious procrastination, I finally dived in and did something about the marks around the rosette created by rosewood dust from cutting groves for the rosette segments as well as some careless leveling of ditto. Somewhere in the back of my head some little persistent devil was sitting, insisting I should do this with a smoothing plane. Last night I couldn't take it any longer, and had to act against convention and advice from books and fellow builders, suggesting the use of sandpaper for this operation, first 150 grit then 220 grit. I figured I could always resort to sanding if the planing didn't work out. OK, I'll be the first to admit it; I'm a stubborn bugger! Off I went. 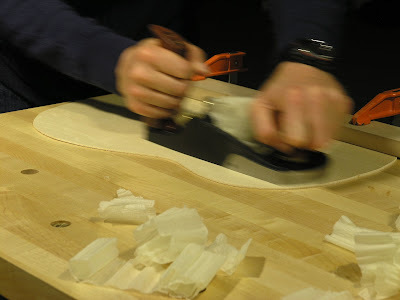 I started by sharpening my 38º blade to the best of my ability and slit it into the Bevel-up smoother, adjusted it to the finest setting possible and secured the soundboard to the bench with a long MDF caul. With even pressure I slowly drove the plane through the spruce, up over the rosette, to the full length of the soundboard. My biggest concern was that the blade would bite into the rosette and tear it up and cause further damage, but it didn't. Instead I got whisper thin slivers of spruce and rosette. 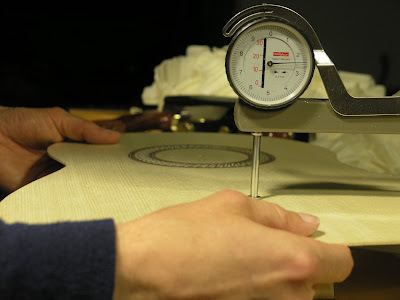 I slowly and methodically planed my way twice from one side soundboard to the other, with full strokes along the grain, until the marks and dust had gone. Next came the thicknessing. I flipped the soundboard over clamped it to the bench with the MDF caul and started planing the back in a similar fashion: With full slightly overlapping strokes along the grain, slowly working my way across the soundboard. Once the first half was planed I unclamped and rotated it and continued on the other half. 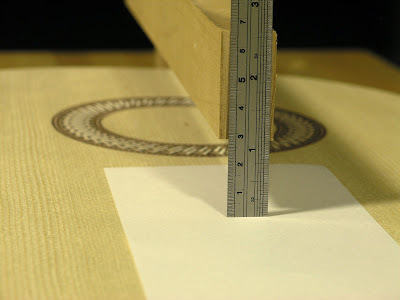 At the starting point the soundboard had an even thickness of 3.2mm all across. After each complete cycle I measured the thickness and marked any area that would be a little thicker and leveled these first, before starting the next cycle. I also tapped the soundboard by holding it by the upper bout with one hand and gently tapping the bridge area with the end of my middle finger of the other. 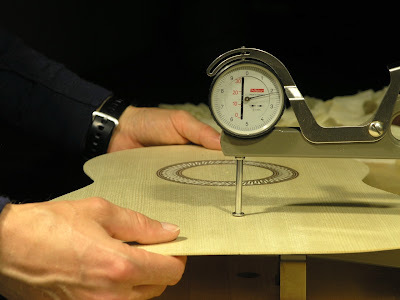 In the beginning the tapping produced a clear ring but as the thicknessing progressed the pitch slowly started to drop and became lower and lower. Supposedly you are striving to thin the top until you reach a pitch where the ring has 'dropped out' and been replaced by a low and indistinct tone, but as this was the first time for me it was hard to determine when that point was reached. Instead I resorted to measuring, tapping and listening along the way, ending up with a final thickness of 2.4mm in the middle, from the bridge area and up, and just under 2.0mm along the periphery of the lower bout. It was interesting to follow the pitch drop as the soundboard got thinner. In the beginning the change was quite noticeable, but as I got closer to the final thickness it became increasingly difficult for me to distinguish the change, which on one hand probably was due to the fact that I started to proceed in smaller and smaller increments, but also lack of experience. One thing I was quite aware of is the it is supposedly typical for the novice builder to overbuild. I just hope I didn't got too far in the other direction.